Are you just wrapping up the 2018 row by row at the participating quilt shops.. Here is one that you don’t have to leave your house for. Just sit by your computer and click on the links to the blogs that will be releasing their individual rows on these set dates. This is the 3rd year that I have joined in this row along… If you have been following at all the 1st year I did The Road Home row with Alberta Canada . and last year Caroling Along with “Winter Wonderland”. My Happy Place is going out for a ride in the morning while the sun rises. Why sunrise? Well in the mornings here it is cooler and much more comfortable to ride than after the sun has come out and heated things up. Also in the morning we have a much better chance of seeing wildlife than after a busy day of traffic. Watching nature wake up is very relaxing.. Did you know that dew will land on cob webs and as the sun strikes them they look like glass pearls. Knowing that I wanted to do a sunrise and a girl riding I purchased a charm pack that had sun and grass colors as I mostly ride in fields. I found 2 charm pack by Northcott fabrics from the Artisan Spirit line Sandscapes that would make this perfect one green and one with Red, orange to yellows. I cut all the pieces to make my row and soon realized that I would have a lot of leftovers.so then I ran to my stash to find fabrics, to make an other row with just plain fabrics for your free pattern.. These are my new fabrics. cowgril placed and appliqued on. So now getting back to those charm squares that I purchased for this row. Since I had so much leftovers I decided to do a 2nd row with a cowboy riding with the cowgirl. I found a picture that I had taken of myself and hubby riding together. It gave me the idea for my row/rows. and I have a water color painting the I also used for inspiration. Photo History of making of the 2 blocks with the Northcott fabrics. Now with the top completed the fun part was to begin.. I’m really enjoying quilting on my longarm when the quilt talks to me. and this one was shouting sun and grass. The male rider will be released on the crafty store once I get my computer back in order from being sent to the doctors. They completely formatted it which wiped out everything thank goodness i had backed up everything. The Cowboy silouette can be found here My happy place cowboy Thank you for your patience. Previous My Happy place… 2018 Row along. This is absolutely beautiful. Reading your story/blog I was waiting with baited breath for the silhouette of the male rider and it was not there.. Are you going to option it on Craftsy? I would love to have it. You chose the perfect colors. Thank you for the row. Thank you. I will put in on craftsy… My laptop broke down so had to send it for repairs 2x this summer and when it came back it was formatted so it wiped out everything i just have to put my file back on here so that i can update craftsy with the full pattern. Beautiful depiction of the early morning. That time when the world is quiet and everything is just starting. You really nailed it with the fabric choices. Thanks for sharing. Thank you VERY much for the awesome quilt and row pattern you are sharing with us. It sure brings back wonderful memories of time spent on my grandparent’s farm and riding horses early morning with grandpa. Beautiful row, thanks for sharing Renee! Wonderful row and perfect quilting on it! Thank you for sharing the pattern with us. Yep, I’m wondering where that second rider option is also :p~ This is an amazing row Renee, but each row each year has surprised me each time and I so remember that first year and that’s what we both have in common. We both started our blogs based on events we had entered. I’ve loved each year you’ve come along to participate and your rows are always amazing this one included. Please let me know how to get that 2nd rider also. Many Many Hugs!! I can email it to you the pattern once i have the file put back in my laptop. the repair person formatted it when i got it back. ill also post in on craftsy for $1..99. The Ride at Dawn is an awesome quilt. Thanks for the pattern information. Gorgeous row! You captured the sunrise beautifully. Breathtakingly beautiful! Thank you. Looking forward to the male rider pattern. This is a really beautiful row. Thank you for the design and the detailed how-to description. Your row is very beautiful. Thank you for the detailed how-to description. This row is gorgeous and the quilting looks incredible…love it! Thanks for sharing your row with us! Such a lovely row and mate to it. I love all the colors of fabric. What a beautiful row. The colors just make it pop. Who wouldn’t be happy in your place! thanks… i do count myself lucky…growing up a city girl and always wanting hoses my dream came true. Oh Renee your quilt and quilting is absolutely stunning. What a wonderful happy place, which certainly brings back many childhood memories of me riding in the mornings on my Grandfather’s farm. I sure hope you will enter your quilt in some quilt shows, to give even more people a chance to see and enjoy it. Total #CreativeGoodness. thank you and yess it will be entered into our local quilt show in 2 years. april 2020. Hope your computer woes are behind you!! me too since it got sent out end of june and was till mid july then i had to send it out again begining of september and it just got back friday. Great row! Thanks for sharing and taking the time to create! I love the saturation of color in your row. Thank you for a wonderful depiction of your theme. Cute row! Thanks for sharing your inspiration and how you made it. I love to go riding too. Don’t get to do it much anymore. 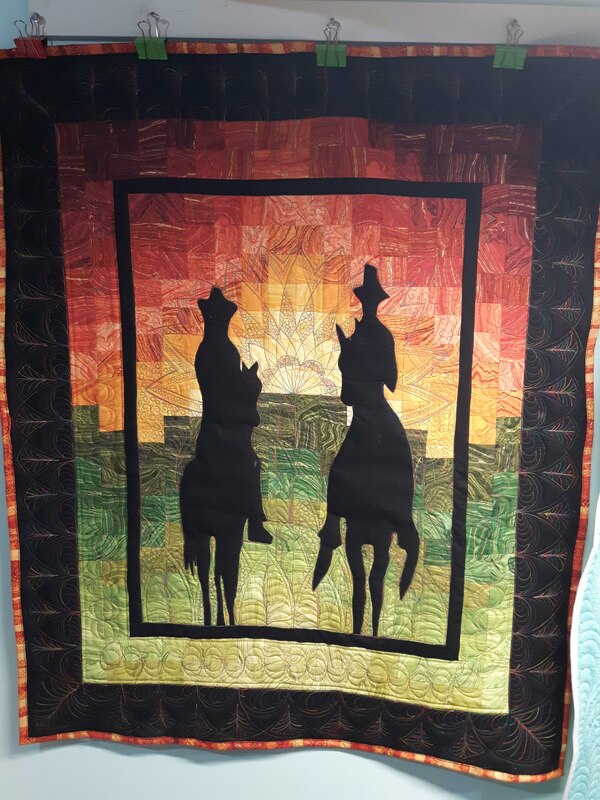 I really like how you quilted your two-rider quilt. Love the pattern! Thank you for sharing. Such a nice row! Love the sunrise! Thanks for sharing!! This is a beautiful row! And I love that you added two riders together for a double row. Thanks for sharing your happy place with us! What a GORGEOUS row!!! You are so Creative!! Have a Grangirlie that would LOVE this! when put together and adding the extra rows it makes it a nice size for a baby or small lap quilt. Very nice row! Early morning rides sound wonderful, would love to do that one day. look into a place that rents horses..
As an Albertan, I love this row! Thank you! Your row brings back fond memories of when I lived in Nevada and would sometimes go out riding to greet the morning or to say goodnight at the end of the day. Thank you for bringing back those wonderful memories. Thank you also for sharing your time, your talent and your creativity. All the best and God bless. Im glad I was able to bring back those fond memories for you.. bless you also. Thank you for the rider “row”. You color choices are marvelous. I don’t get around horses much these days but you have reminded me of my childhood. Thanks for those good old days memories. glad to stir them up. Thank you for the pattern. I love the background you created for the silhouette. Your row is stunning. I love the marbled fabric colors. And your quilting is gorgeous. Thank you. Thanks so much for being a part of the Row-Along! Like so many others, I think the colors depicting the morning sunrise are just perfect! Your block is really beautiful! I appreciate how much time and effort went into preparing this block. Blessings!!! Awesome! I love this! And thanks for the cowboy template! I love your row but the story of why you created this row enhances it. I can picture you on an early morning ride with a partner as the sun is coming up. The quilting design detail is a nice addition. This is such a beautiful row! Makes me think of summers in Montana when I was a kid. Thanks for sharing! glad i could trigger a memory.